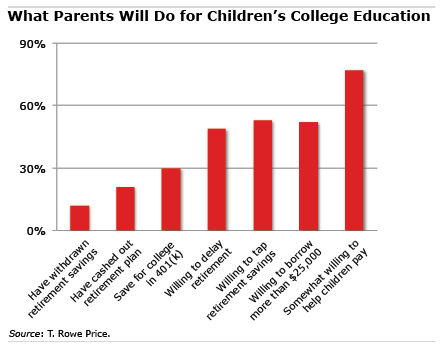 Parents have spoken: paying for college is affecting their retirement planning. Two new surveys indicate that the surge in college costs is impinging on Americans’ retirement finances. One survey, by the research firm Hearts & Wallets, found that boomer parents who support their adult children are more likely to delay retirement than parents of financially independent offspring. The second survey, by the mutual fund manager T. Rowe Price, found that half of parents are willing to delay retirement or dip into their retirement savings to fund college. The surveys included young, idealistic parents as well as parents staring down the barrel of the retirement gun, and parents whose children achieved financial independence years ago. Nevertheless, these responses consistently show a willingness to trade retirement security to pay for their children’s college education. The findings aren’t shocking, since parenthood is defined by sacrifice. But financial planners offer some tough advice about parental financial obligations, especially for clients zeroing in on retirement. Parents – as opposed to their offspring – have relatively few years left in the labor force to save for retirement. In this video by KUTT-TV in Anchorage, Alaska, Fred Keller and Judy Foster show off their retirement project: they transformed a 1976 pickup truck into an oversized replica of a Radio Flyer wagon they can drive around town. While a new red wagon isn’t for everyone, it illustrates an important point: retirees need to find ways to remain active. Older people warn that retirement shouldn’t be viewed exclusively as a time to “relax,” a well-deserved break. People who enter retirement expecting nirvana often find they’re bored stiff, or even depressed, due to an abrupt drop in productivity after decades of working. Retirees also spend a lot of time alone or watching television. This blog often promotes the benefits of financial health and mental health that come with working longer. When making financial preparations for retirement, preparation should also include thinking about pursuits such as working on a long-neglected project or hobby, writing a family history, or finding a social group, part-time job, avocation, or volunteer work to add structure and purpose to one’s life.